Puff The Magic Dragon (our new diesel heater) continues to give us problems. While waiting on more parts to arrive from Seattle on Monday, we head off to Pender Island for the weekend. We are familiar with the route as just two weeks ago we had anchored here after departing Philbrooks for what we thought was the beginning of our trip north. Never in our wildest dreams did we imagine we would still be in the area with heater problems. More on that later. Pender Island is one of the Southern Gulf Islands. 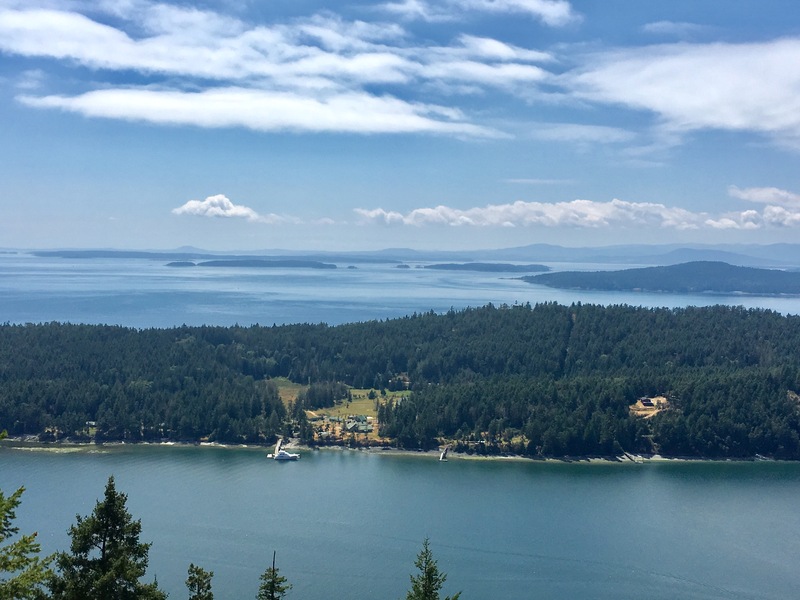 The Gulf Islands are Canada’s version to the San Juan Islands in the U.S. 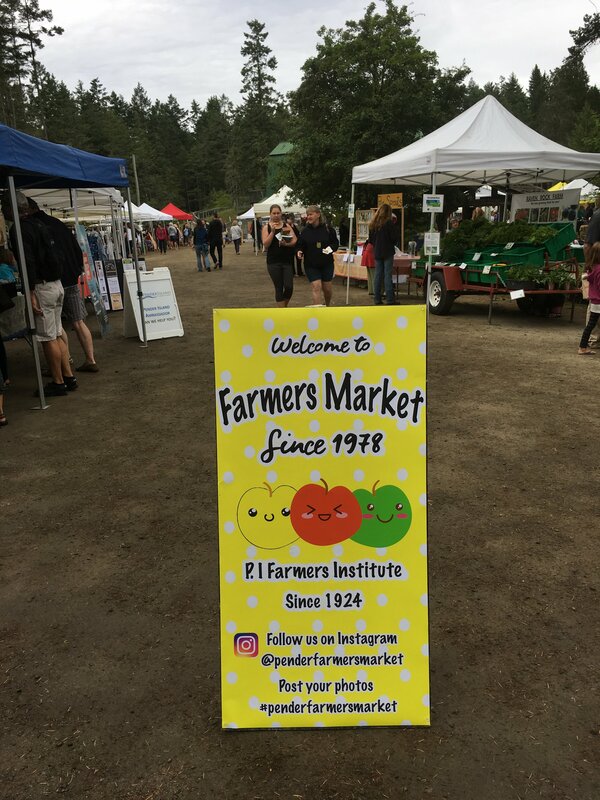 They are located just a few miles from the San Juan Islands just north of the border between Vancouver Island and the mainland of British Columbia. One could spend many years exploring these islands. 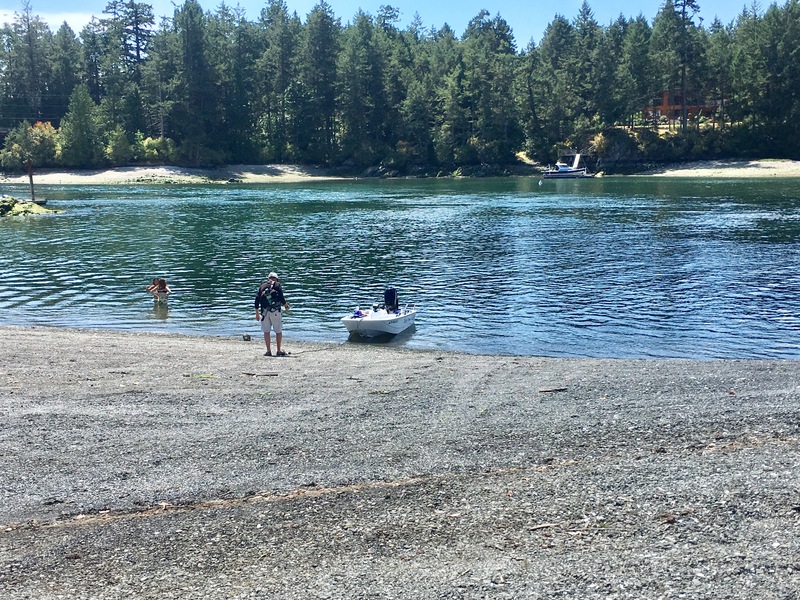 Within just a few miles of each other is a plethora of anchorages for boaters to choose from, many within the Canadian Park System. Most of the cruising is in very protected waters with little wind and almost no rain during the summer months. 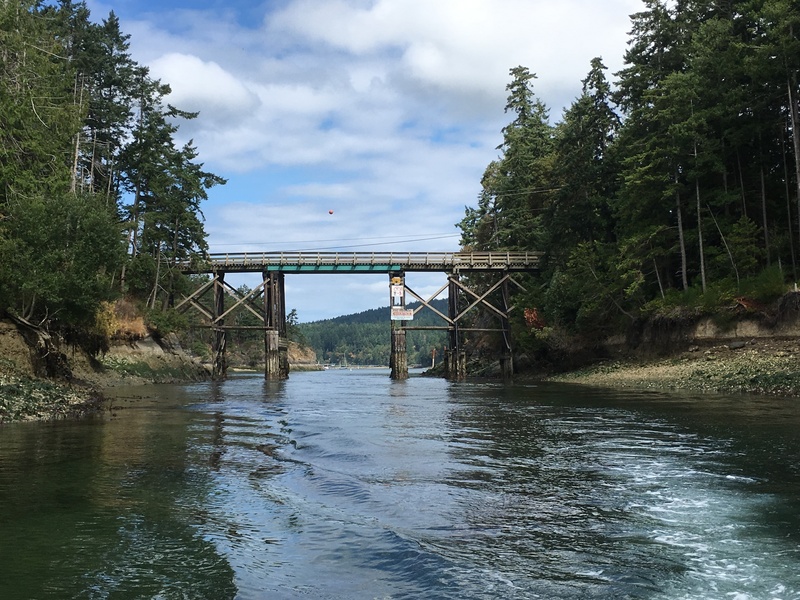 Pender is one of the more populated Gulf Islands with about 2500 permanent residents and many more summer residents. The island is separated into North and South Pender with rolling forested hills and farmland. There are two harbors for boaters to choose from. 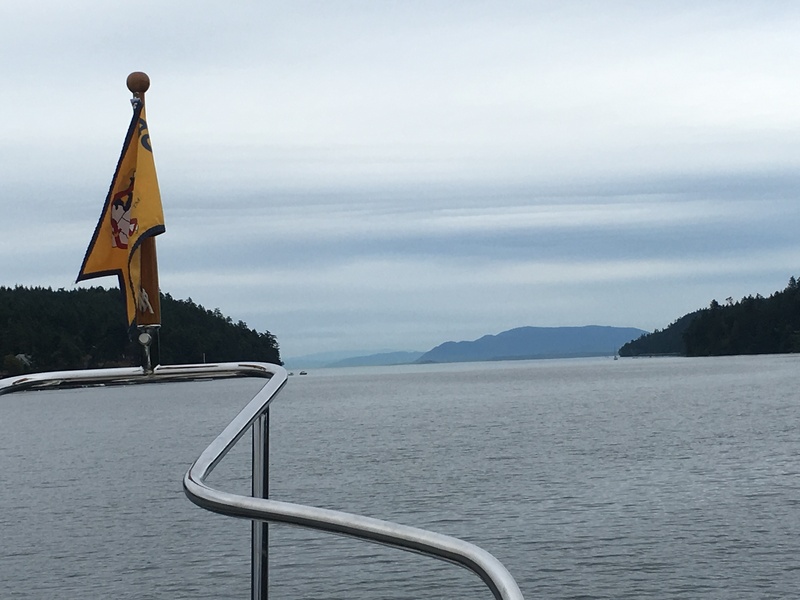 We anchor in Port Browning Harbor on North Pender Island. It is a large harbor with room for many boats. The anchorage like many in these waters is deep. We find a spot in 40 feet of water. With a five to one scope, we let out 200 feet of chain just outside the marina breakwater. Manny, our yellow duck anchor monitor, is excited to be next to one of his bigger cousins. 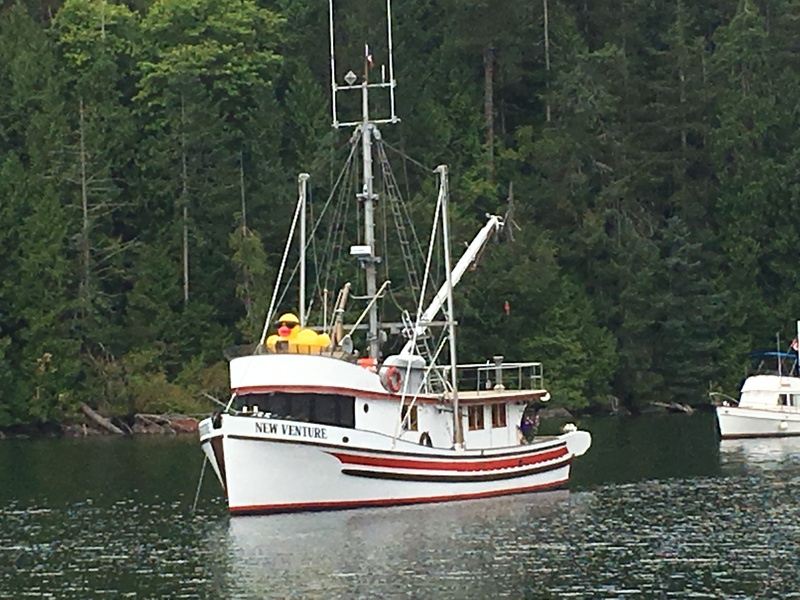 Check out the yellow duck aboard this trawler. There is a farmers market on Saturday morning a few miles from the marina. We load the bikes into the dinghy and head to shore. We know from previous exploration that the Gulf Islands are hilly. But it is only a few miles to the Farmers Market. How bad can that be? As we exit the parking lot, a steep hill looms ahead. Not even a half mile from the marina, we are thinking maybe we should have just walked. Again, there is one steep hill after another. You would think we would have learned by now that biking on these islands is always a challenge.. The farmers market is in full swing when we arrive. This market has been going on since 1978 and seems to draw most of the islanders. We purchase some fresh blueberries and a loaf of fresh apricot bread. A hot fresh cinnamon roll is needed for fuel to get us back up and over the many hills. After the farmers market, we continue on the bikes to Sea Star Winery. And yes, more hills to get there! Our efforts are rewarded with a beautiful winery and a tasting of their fantastic wines. It seems they have been very successful and were voted best wine in Canada for one of their whites. Jeff’s backpack is loaded down with two bottles. I think he would have revolted if asked to carry any more weight over the hills and back to the boat. Needless to say, we were both exhausted when we arrived back to the harbor. Maybe next time we will try hitch hiking. The island has designated stops all over the island marked as “ car stops”. Drivers can choose who they pick up and you also can choose which drivers you accept a ride from. 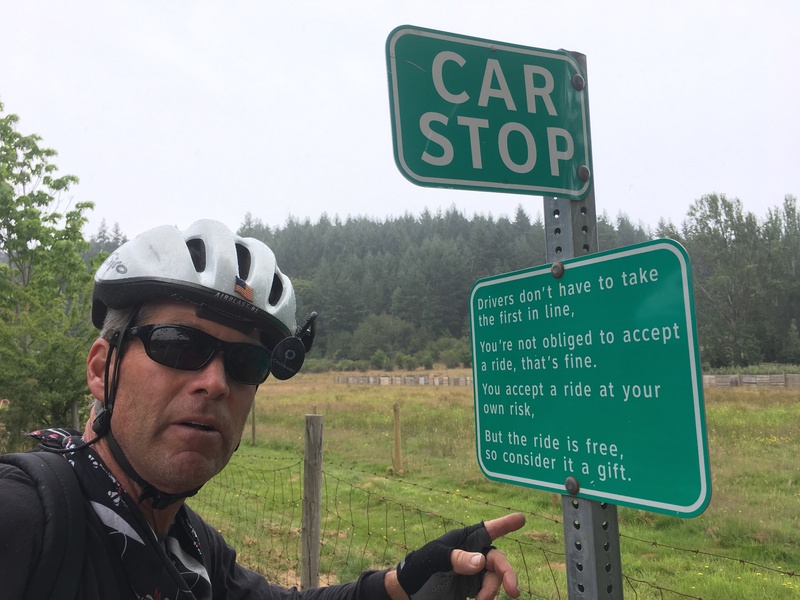 If you do accept a ride it is free. 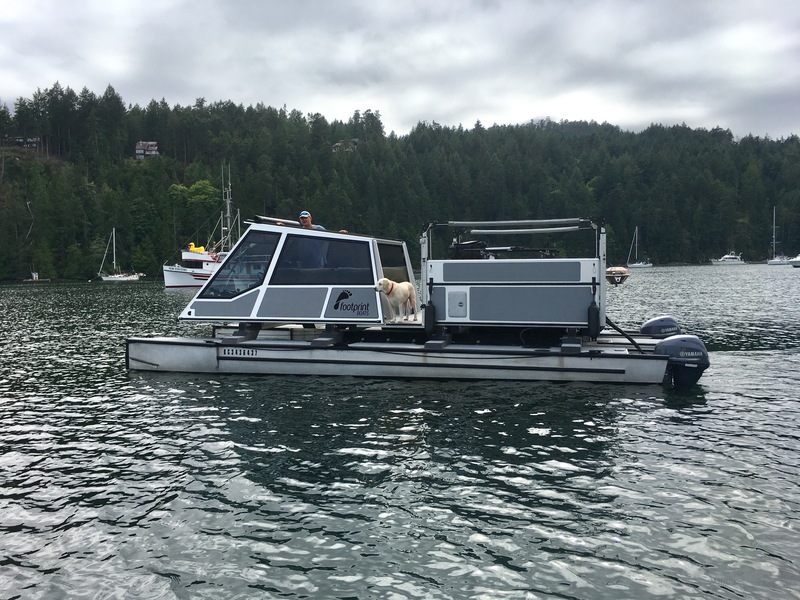 Ian, our heater project manager at Philbrooks and now a good friend, brings his boat over from Sidney to say hello. This is not your ordinary boat as you can see from the picture. Ian designed and built this boat himself. It is a wonderful and practical boat design. The back section is a camper that raises up and folds out. He hopes to someday market this design as it contains many innovative features. Ian is a brilliant boat designer and is ahead of his times. 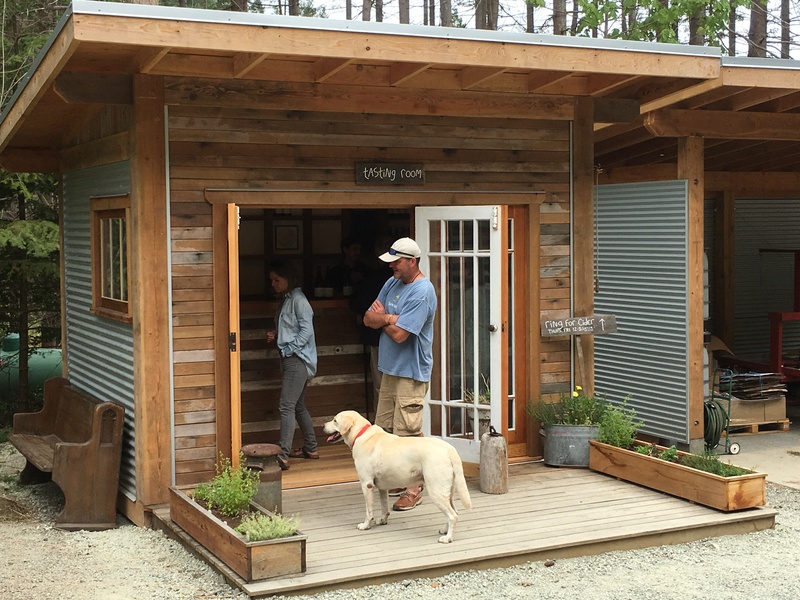 We join Ian for a visit to a friend of his nearby who owns the Twin Island Cidery here on Pender. We enjoy meeting Noel and Saundra, the owners of the cidery and sampling some of their ciders. Their five varieties of ciders are all amazing. 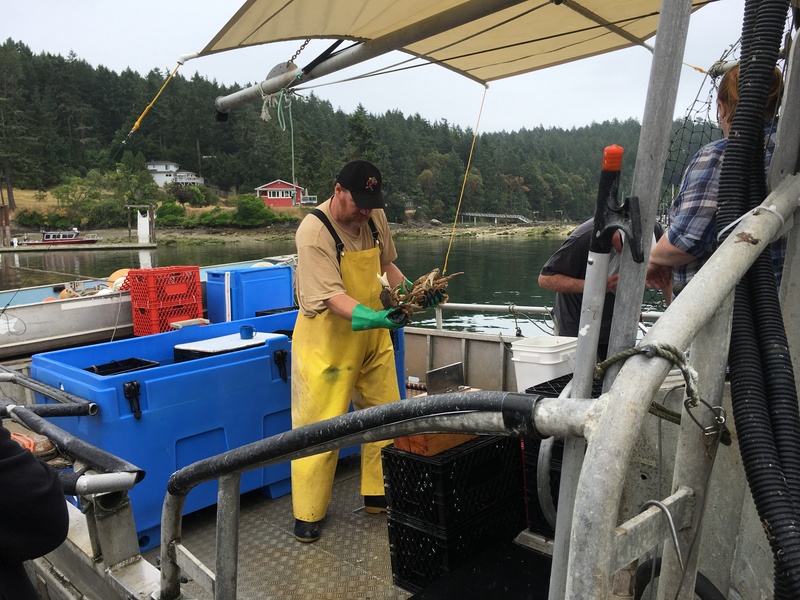 Over the past month we have been accumulating new fishing gear for PNW fishing, mainly salmon and halibut. The fishing here is totally different than what we are used to on the east coast. 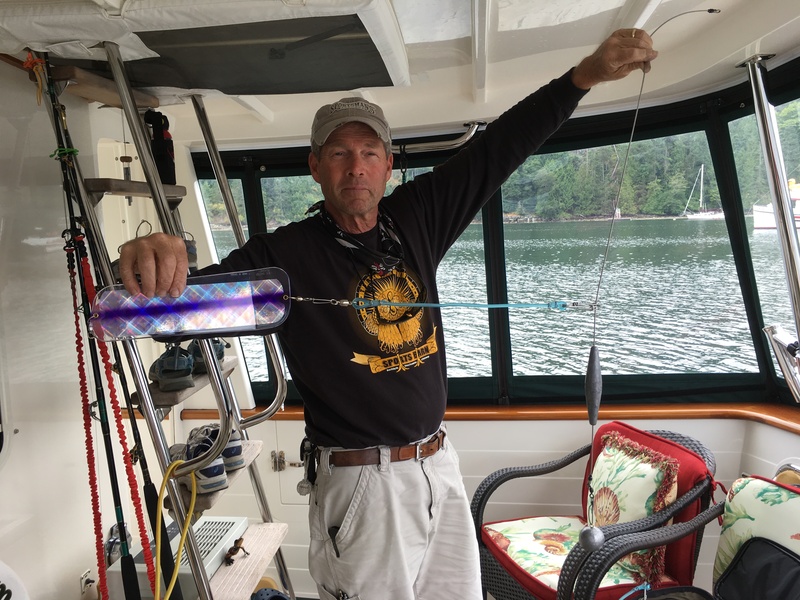 Most of the fishing is deep, 100 feet or more, and mostly done with down riggers to get the lures that deep. Our afternoon is spent setting up our gear and making a practice run of trolling in our dinghy. We never got the first bite but are probably not in the right area. We are on a steep learning curve. 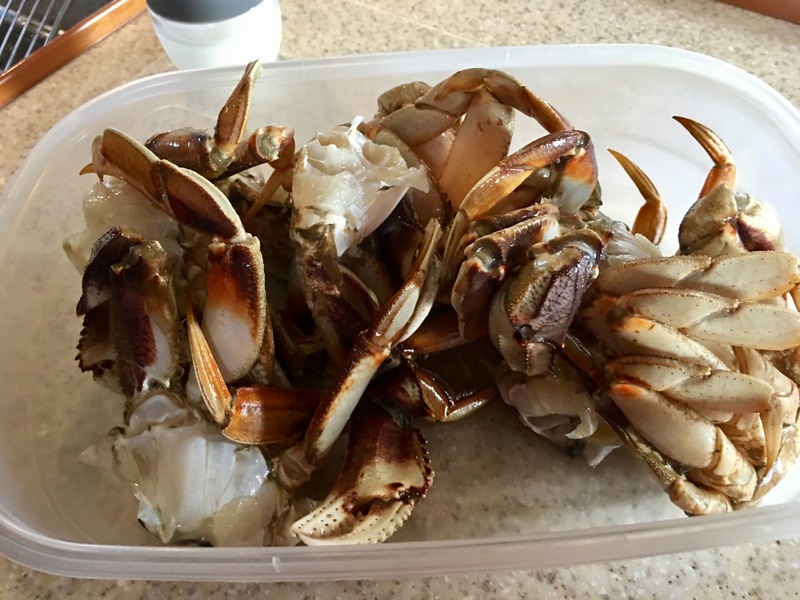 No salmon for dinner but we do enjoy some steamed Dungeness crab. 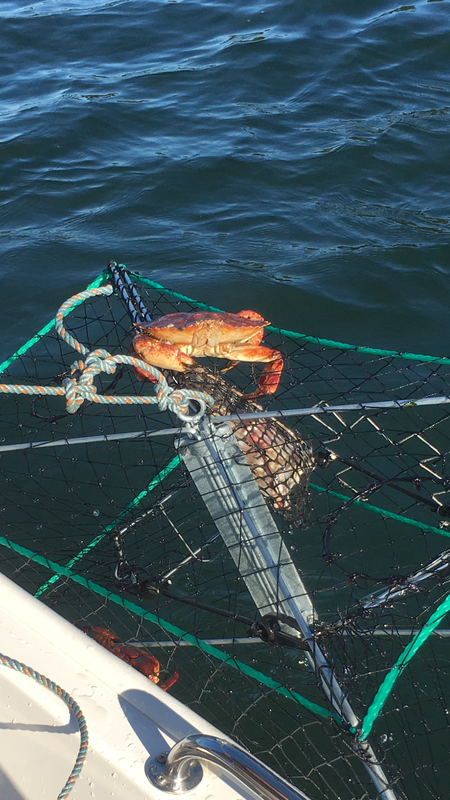 We set our crab traps in the harbor but once again trap only Rock Crabs. We raised the surrender flag and purchased four beautiful crabs from the “Crab Man” who sells his catch each Saturday at the marina docks. We feel like crabing weenies but they were incredibly good steamed with melted butter and fresh bread from the farmers market. We will continue to refine our crab catching techniques. We ditched the bikes and spent Sunday exploring in the dinghy. Between North and South Pender is the Pender Canal. This narrow man made channel has swift currents and a bridge which restricts boats higher than 27 feet from transiting. We could get through with Idyll Time but it would be a scary passage with the strong currents and limited visibility from one end to the other. 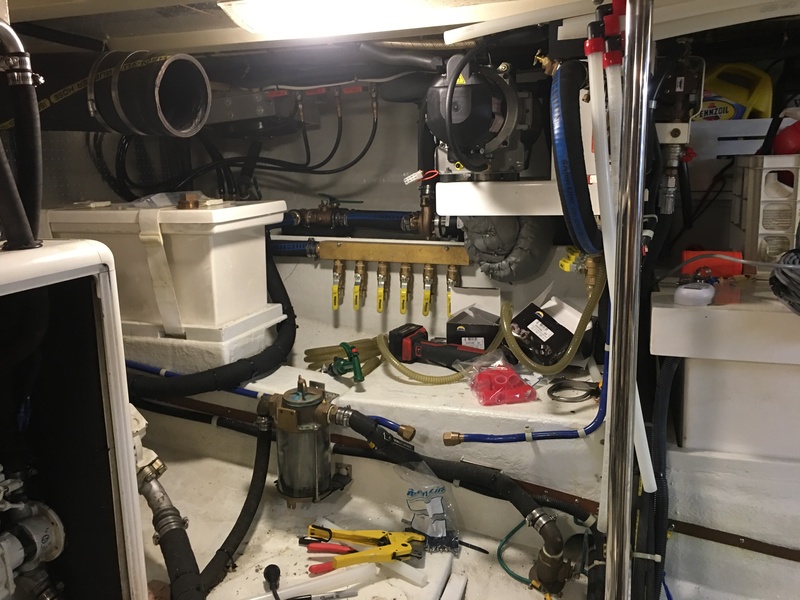 We decide to play it safe and explore this passage in the dinghy. South Pender has some nice hiking trails which are part of the Gulf Park. We beach the dinghy at low tide to climb Mt. Norman, the highest peak on the island. It is a short climb of only 2.6 kilometers. How hard could that be, eh? 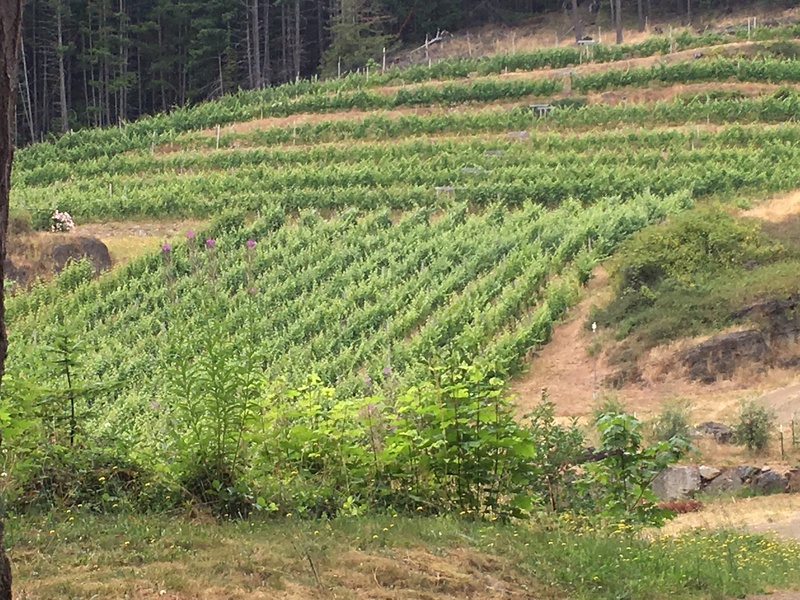 Have we mentioned that the Gulf Islands are hilly? Yes, this hike was just like our bike rides- straight up. The Canadians don’t believe in switchbacks. We climb up and up the mountainside almost 1000 feet in one kilometer. The views from atop Mt. Norman were spectacular. We can see over 40 miles on this cloudless B.C. day. So, back to our boat saga. The new fuel solenoid arrived and was installed. Unfortunately, this did not fix the problem. More phone calls were made. The distributor asked that the heater be returned for inspection. OK, but that will take days and maybe weeks to get done. We don’t want to be sitting at the dock while all this goes on. This is where we intervened and called the supplier. They have now agreed to ship a new heater and control board overnight. It should arrive tomorrow by noon. We will head back to Philbrooks tomorrow morning and wait for it to be installed. Our fingers are crossed that this will solve our heater issues. This entry was posted on July 26, 2017 at 2:56 am. You can follow any responses to this entry through the RSS 2.0 feed. You can leave a response, or trackback from your own site. 1 Response to "Pender Island"
Just caught up on your blog Susie and Jeff. We feel your pain on those repairs…especially with a new installation! We now have two rebuilt transmissions that took us out of commission for 7 weeks! We are back in Michigan for a while (boat is waiting for us in S Carolina). We look forward to reading about your PNW cruising soon! !